This tutorial explains how to use PROC FREQ with various examples. 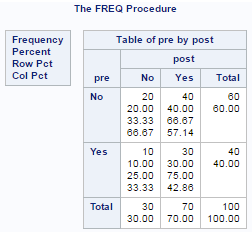 The PROC FREQ is one of the most frequently used SAS procedures which helps to summarize categorical variable. It calculates count/frequency and cumulative frequency of categories of a categorical variable. In other words, it returns the number and percentage of cases falling in multiple categories of a categorical variable. It's not just restricted to counts. It also produces bar charts and tests for association between two categorical variables. The program below creates a sample SAS dataset which would be used in further examples to explain PROC FREQ. Suppose you want to see the frequency distribution of variable 'y'. The TABLES statements tells SAS to return n-way frequency and crosstabulation tables and computes the statistics for these tables. It answers a question 'which category holds the maximum number of cases'. In this case, the category 'C' contains maximum number of values. Categorical variables are of two types - Nominal and Ordinal. A nominal variable is a categorical variable in which categories do not have any order. For example, gender, city etc. An ordinal categorical variable has categories that can be ordered in a meaningful way. For example, rank, status (high/medium/low) etc. 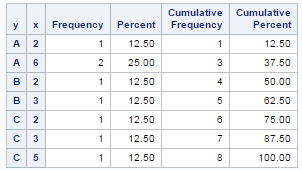 Suppose you do not want cumulative frequency and cumulative percent to be displayed in the table. The option NOCUM tells SAS to not to return cumulative scores. If you want only frequency, not percent distribution and cumulative statistics. Suppose you want to see the distribution of variable 'y' by variable 'x'. The output of the above SAS program is shown in the image above. The forward slash followed by LIST keyword produces the list styled table. The NOROW option hides row percentage in cross tabulation. Similarly, NOCOL option suppresses column percentage. The tables y*(x z) statement is equivalent to tables y*x y*z statement. In this case, it returns two tables - y by x and y by z. The NLEVELS option is used to count number of unique values in a variable. In this case, it returns 3 for variable Y. The WEIGHT statement is used when we already have the counts. 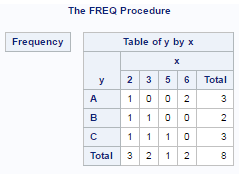 It makes PROC FREQ use count data to produce frequency and crosstabulation tables. Suppose you wish to save the result in a SAS dataset instead of printing it in result window. The OUT option is used to store result in a data file. NOPRINT option prevents SAS to print it in results window. The CHISQ option provides chi-square tests of homogeneity or independence and measures of association between two categorical variables. Also it helps to identify the statistically significant categorical variables that we should include in our predictive model. All the categorical variables with a chi-square value less than or equal to 0.05 are kept. The bar chart can be generated with PROC FREQ. 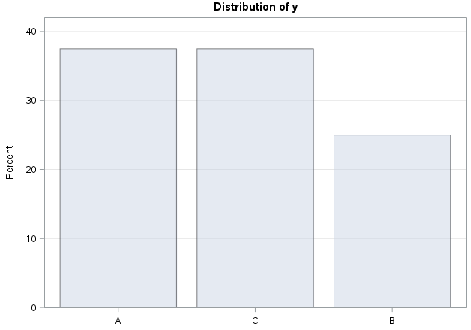 ​To produce a bar chart for variable 'y', the plots=freqplot (type=bar) option is added. By default, it shows frequency in graph. In order to show percent, you need to add scale=percent. The ODS graphics ON statement tells SAS to produce graphs. Later we turn it off. By default, PROC FREQ does not consider missing values while calculating percent and cumulative percent. 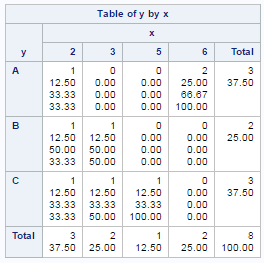 The number of missing values are shown separately (below the table). Refer the image below. By adding MISSING option, it includes missing value as a separate category and all the respective statistics are generated based on it. In PROC FREQ, the categories of a character variable are ordered alphabetically by default. For numeric variables, the categories are ordered from smallest to largest value. It is generally advisable to show distribution of a nominal variable after sorting categories by frequency. For ordinal variable, it should be shown based on level of categories. To order categories based on a particular FORMAT, you can use order = FORMATTED option. PROC FREQ is a simple but powerful SAS procedure. This tutorial was designed for beginners who have no background of any programming language. Hope the above examples help to understand the procedure crystal clear. 24 Responses to "Proc Freq Explained with Examples"
Good question bank and explanations.Keep posting!! Good Work, luck to stumble upon your site. Amazing tutorial. Keep up the good work! Well explained. I have 1 query regarding ods file. We are using VM space and when we are trying to save the following error occured. Could you please help. WARNING: Style FORNESUG not found; Rtf style will be used instead. ERROR: Insufficient authorization to access /opt/sasinside/SASConfig/Lev1/SASApp/C:\Users\kiran\table1a.rtf. Excellent explanations. Really easy to understand SAS programming through your portal. Excellent explanations. You make me the life easier. That is a very nice and well explained summary, thank you! thanks for excellent turorials. copy and pasted your code but not working..